Q. How can I access the DSM-5? The fifth edition of the Diagnostic and Statistical Manual of Mental Disorders, or DSM-5, is available online to the DU community through our subscription to PsychiatryOnline, which includes the DSM Library and the APA practice guidelines. Published by the American Psychiatric Association in May 2013, this long anticipated revision represents ten years of collaborative work by mental health and medical professionals, as well as patients and their families, to update the criteria for the diagnosis and classification of mental disorders. The DSM-5 can be accessed from the library’s home page by selecting the “Databases” link, then clicking on “D” to search databases by title, and then clicking on the link for the DSM Library. Once in the DSM Library, you will see a description of the DSM-5, a link to the full text by table of contents, and a link to the online assessment measures. 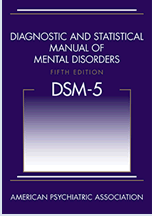 The DSM Library also includes electronic access to previous editions of the Diagnostic and Statistical Manual, from the DSM-1 (1952) through the DSM-IV-TR (2000). The DSM Library and PsychiatryOnline are also listed under database subject categories for "Psychology—Most Useful” and “Social Work—Most Useful,” or you can search for the DSM-5 by title in the library catalog.